As one of our five senses, hearing is extremely important. Our ears are sensitive and care must be taken to prevent damage, as when it’s incurred, it’s almost always irreversible. In industries where a significant amount of noise is generated, it’s important to minimise these risks. These industries include demolition and construction, but also many others such as retail & leisure, healthcare, transportation and renewable energy. Did you know that being exposed to just 15 minutes of 100 or more decibels of noise causes hearing damage? In some industries, that level of noise is commonplace. This means that precautionary measures must be put in place to minimise risk and protect auditory health. The first step is what is called a Noise Impact Assessment Report. Highly-trained professionals will use state of the art equipment to determine whether noise levels are within the relevant guidelines. From there, the client will be provided with a detailed report stating the permissible noise level and offering them tailored recommendations to help them adhere to it. Employees, residents and members of the public need to be prioritised and protected. The first step in doing this is the carrying out of a noise assessment, which will show how existing noise levels impact a proposed development and similarly, how a proposed development impacts existing noise levels. In many cases, a noise assessment will provide supplementary backing for a planning application. Once planning permission has been approved by the relevant local authority, noise impact assessments can be utilised to satisfy the guidelines of a planning consent agreement. 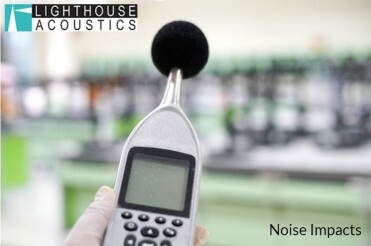 The needs of our clients are extremely important to us, which is why we offer such a thorough and detailed Noise Impact Assessment Report process wherein acoustic readings will be taken, data will be analysed and relevant advice will be offered. We serve private and public sector clients across the UK at competitive rates. We’d love to hear from you so please don’t hesitate to get in touch.